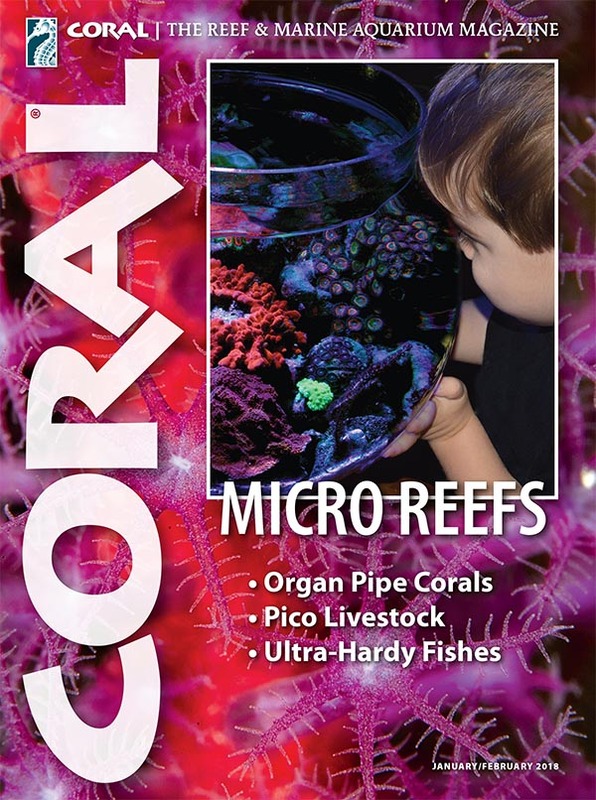 The cover of CORAL Magazine Volume 15, Issue 1 – MICRO REEFS – January/February 2018. 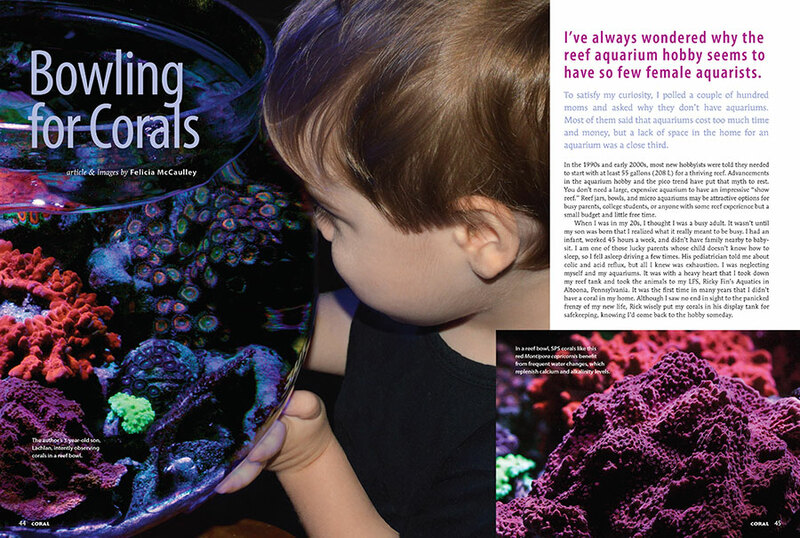 On the cover: Micro reef in a bowl with its young co-keeper, Lachlan Frost. Image credit: Felicia McCaulley. Background: Paraplexaura sp., by Daniel Knop. 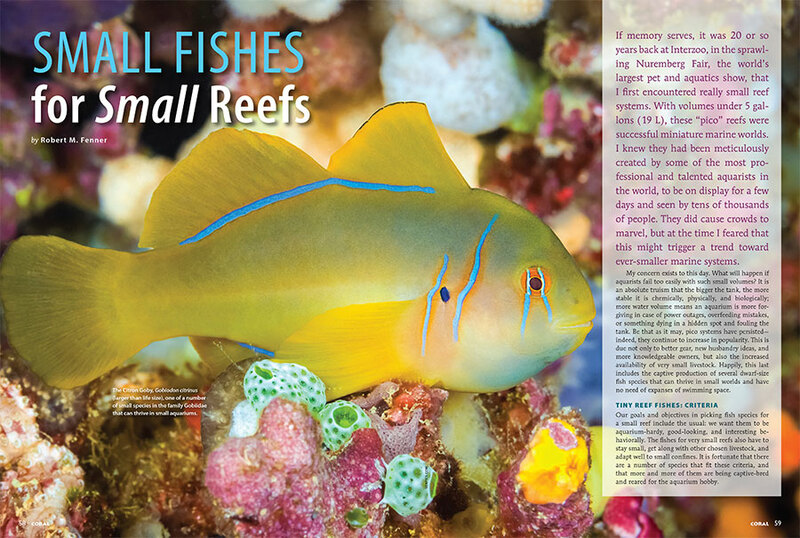 CORAL Magazine’s exciting first issue for 2018, the January/February issue, MICRO REEFS, is printed and will soon be delivered to subscribers, local aquarium shops, and select bookstores—on sale January 2nd, 2018, at the best marine aquarium retail stores and leading Barnes & Noble stores everywhere. 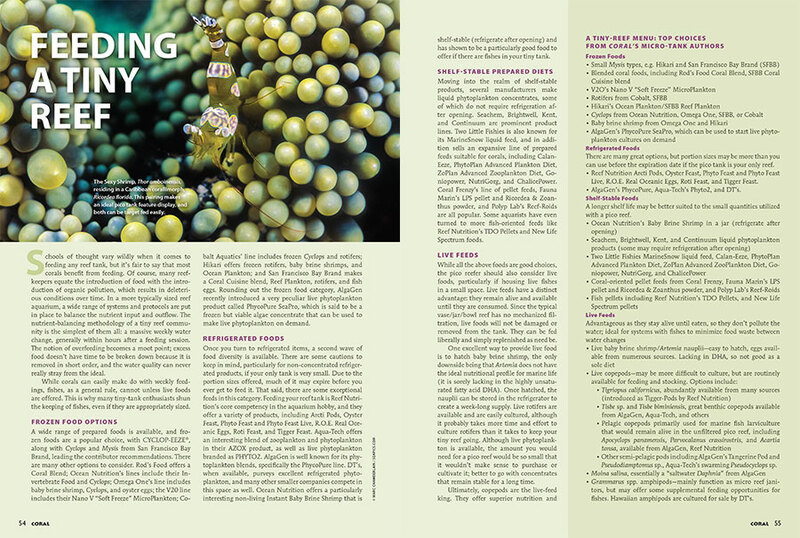 The Table of Contents for the January/February 2018 edition of CORAL Magazine, MICRO REEFS! 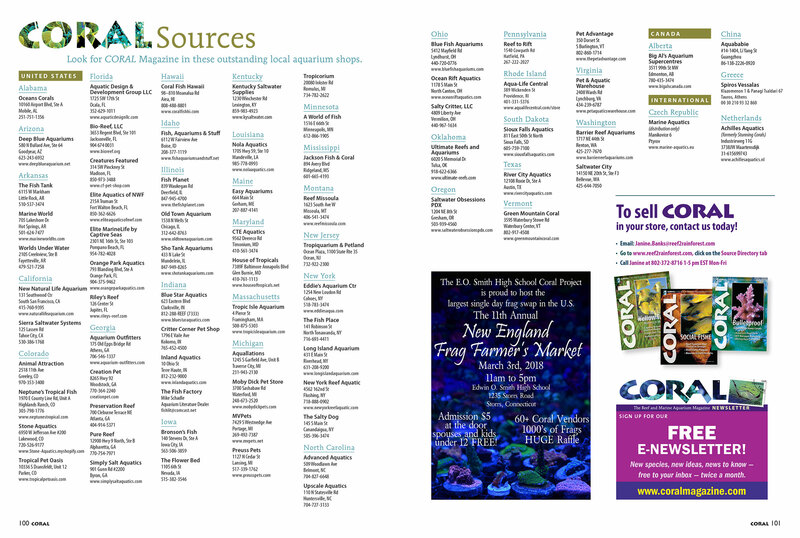 You can view an online copy of the Table of Contents here. Daniel Knop examines the nature of aquarium experience and learning from mistakes. 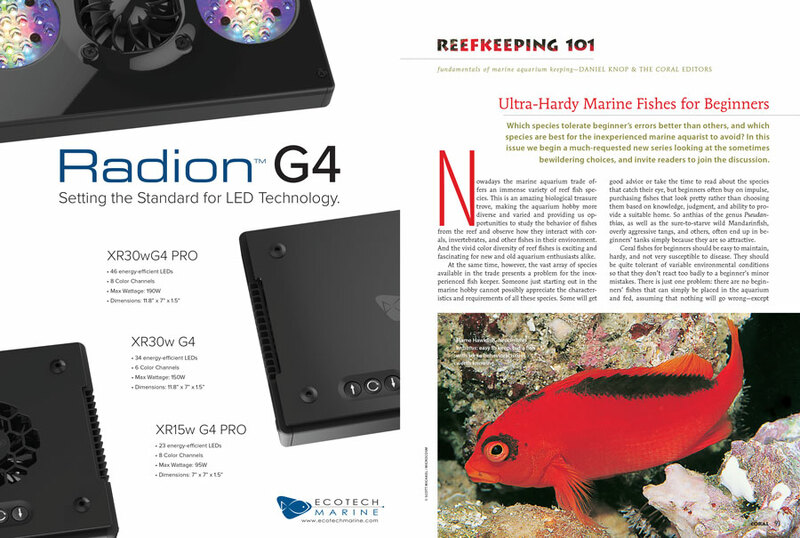 “The core message of this issue’s Reefkeeping 101 article, the first in a series on the best fish species for new aquarists, is that choosing reef fishes solely based on form and color is almost invariably the quickest route to disaster.” Our latest Reefkeeping 101 series will get the new reefkeeper on the path to success, learning from the mistakes of others instead of making your own! 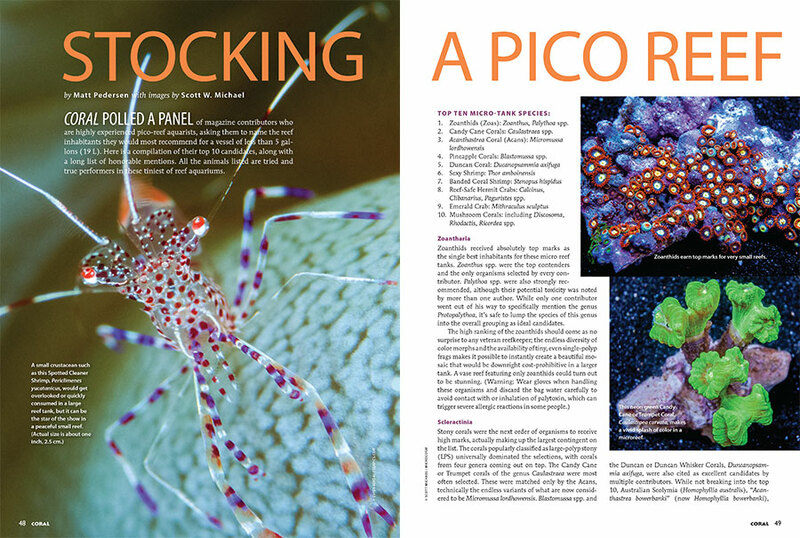 “Having dabbled in setting up a couple of ultimately ill-fated micro reef tanks, I personally found this issue’s recipes for success highly instructive…A tiny reef can be very unforgiving, but pico maintenance involves precious little water and time compared to managing a 200- or 300-gallon full-blown reef system. 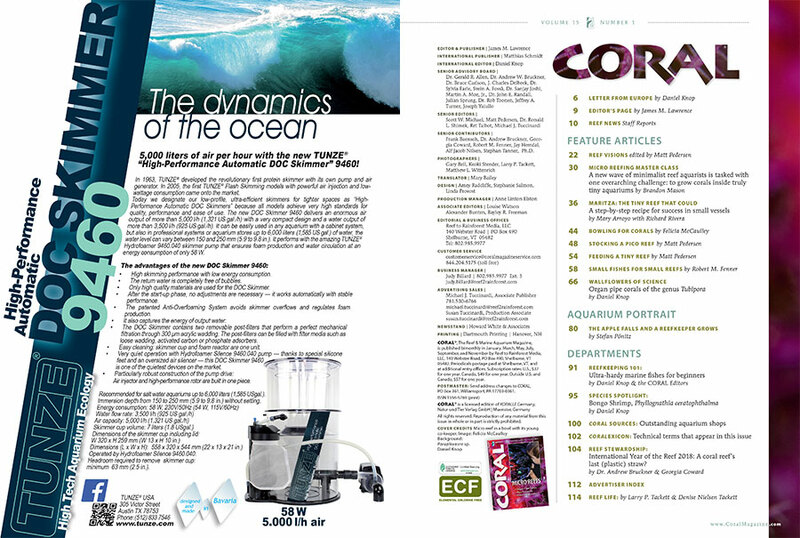 Setup is a lark, equipment is relatively modest in price, and stocking with a few extra-choice frags is a rare new challenge.” -CORAL editor & publisher James Lawrence, introducing our feature topic for the issue. 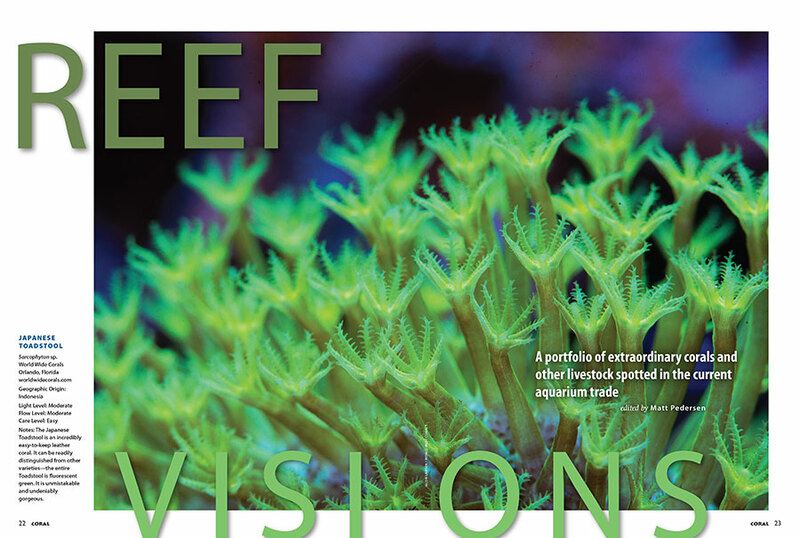 Changing life under Antarctic sea ice, an explosion in Triplefin populations, and Triton Snails in the battle against the Crown of Thorns Starfish: all stories in the newest edition of CORAL Magazine’s Reef News. 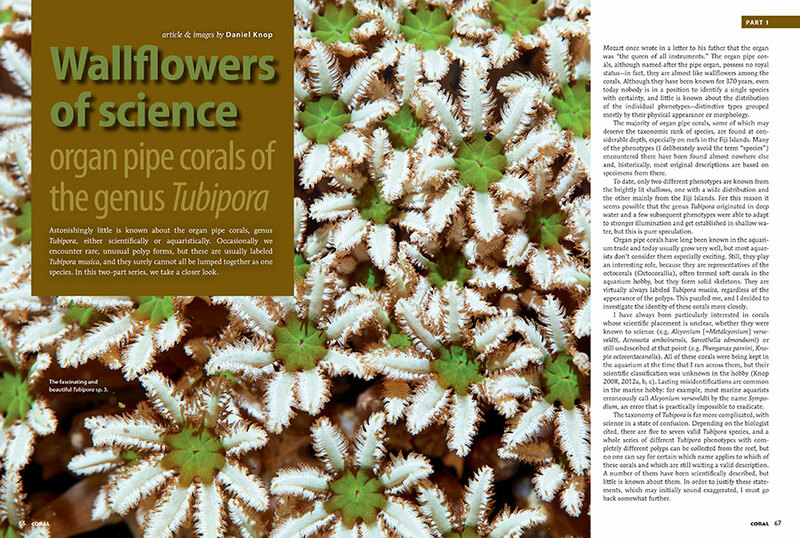 CORAL’s REEF VISIONS column returns, opening with the stunning Japanese Toadstool coral, as shared by World Wide Corals. What surprises lurk within the subsequent pages? We hope you’re ready after winter break, because school is back in session. 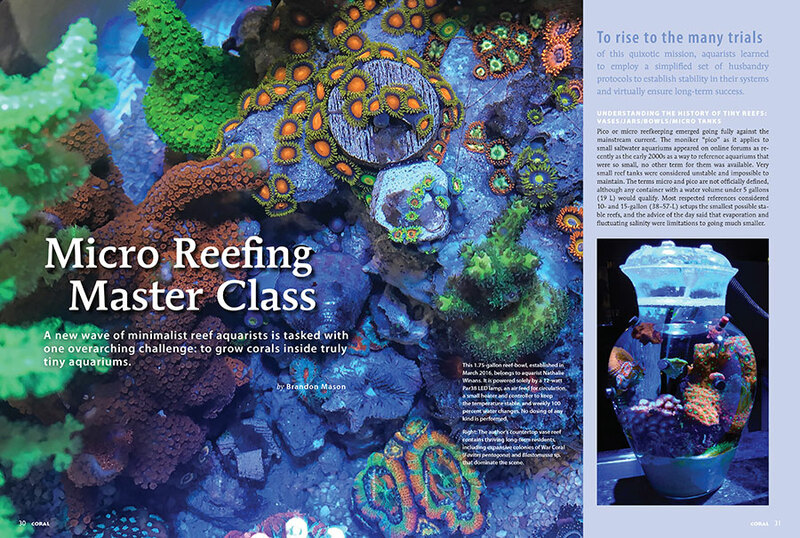 Are you prepared to take Brandon Mason’s “Micro Reefing Master Class”? Your class project is to grow corals inside truly tiny aquariums. Simplified success in a vessel with less than 3 gallons? 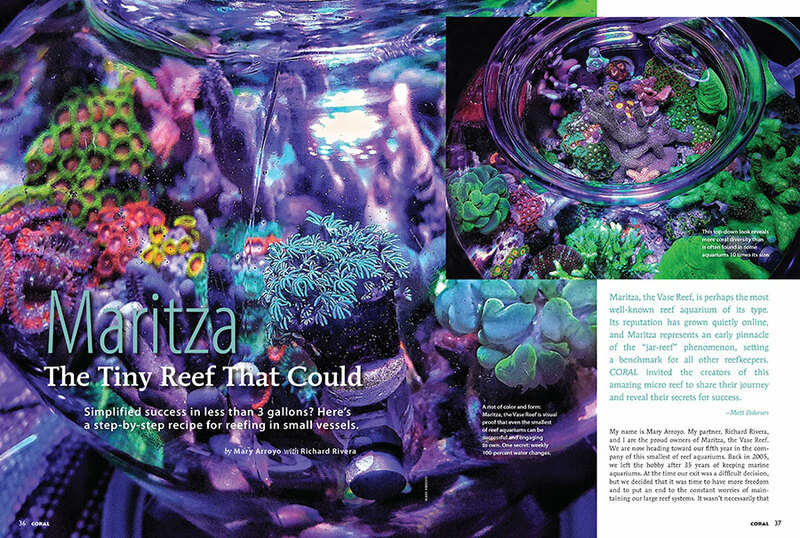 Here’s a step-by-step recipe for reefing in very small tanks, from Mary Arroyo and Richard Rivera, the brains behind Maritza, the Vase Reef. Struggling with first-time motherhood, Felicia McCaulley had to put reefkeeping out of her life for a time. 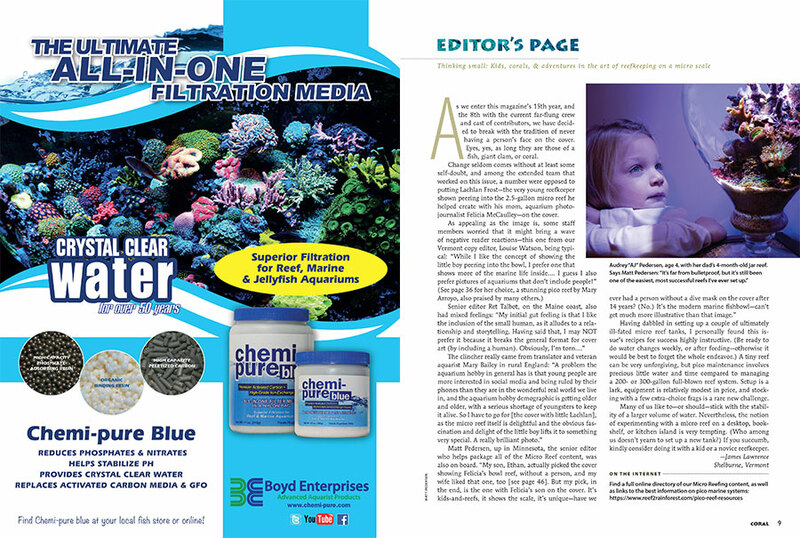 But as any experienced aquarist knows, aquariums find a way to get back into your life. For McCaulley, the reef bowl was the perfect solution to the problems of time, space, and money. 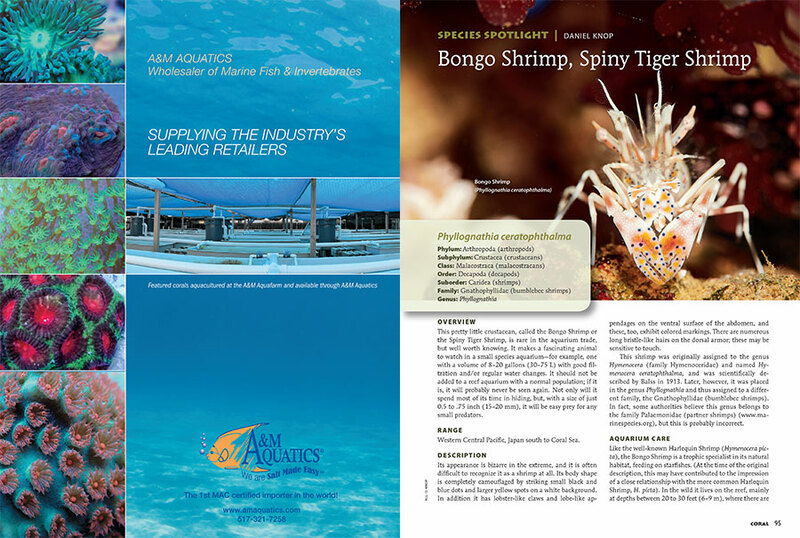 Continuing our theme of leveraging the experience of others, several veteran pico reef aquarium keepers were asked, “What are your top 10 pico reef inhabitants?” The results are in, and Matt Pedersen shares them all, plus dozens of well-suited honorable mentions that will be sure to perform well in even the smallest of reef aquaria. Pico reef aquarists find that feeding is integral to success with the smallest of reef aquariums. 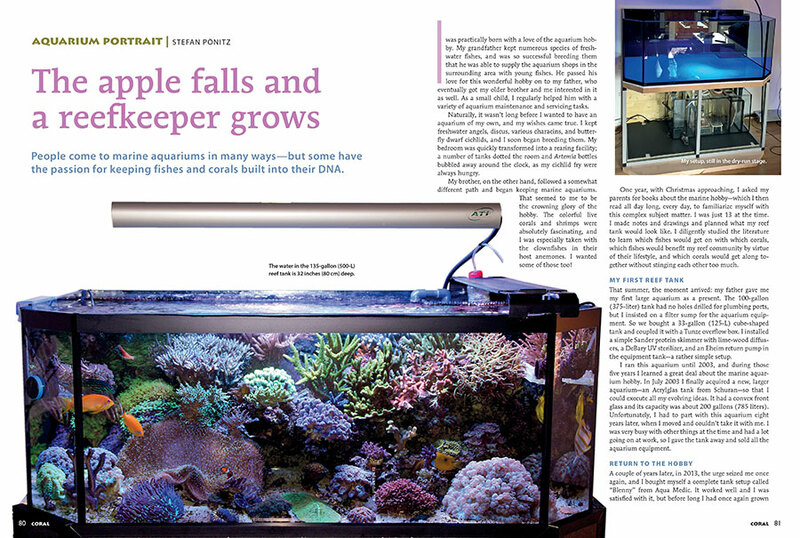 Matt Pedersen surveys the diversity of options available to the micro reefkeeper. 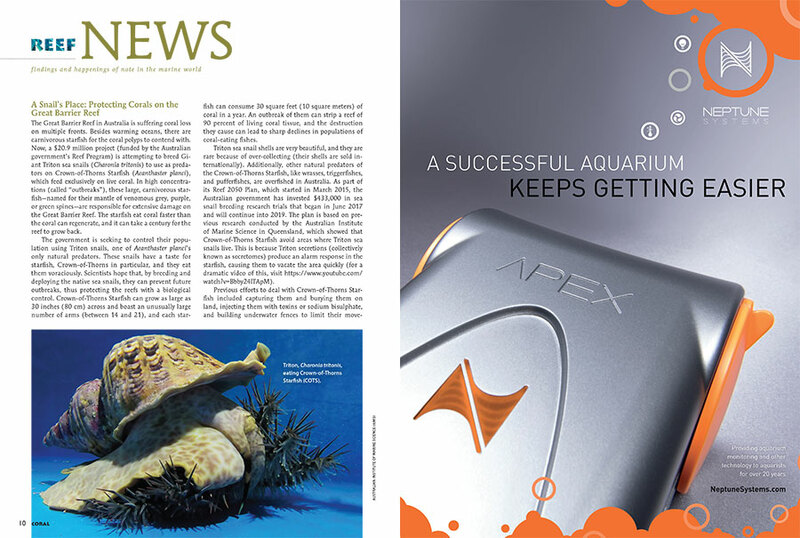 Regular CORAL contributor and bestselling author Bob Fenner shares his thoughts on the right fishes for the smallest reef aquariums. The apple falls and a reefkeeper grows: People come to marine aquariums in many ways—but some have the passion for keeping fishes and corals built into their DNA. 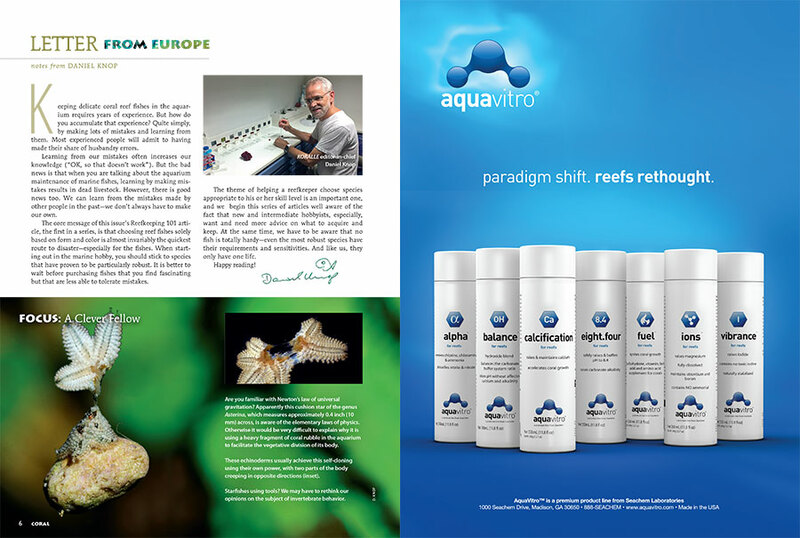 Meet Stefan Pönitz in this issue’s Aquarium Portrait. Which species tolerate beginners’ errors better than others, and which species are best for the inexperienced marine aquarist to avoid? In this issue we begin a much-requested new series looking at the sometimes bewildering choices, and invite readers to join the discussion. This pretty little crustacean, called the Bongo Shrimp or the Spiny Tiger Shrimp, is rare in the aquarium trade, but well worth knowing. It makes a fascinating animal to watch in a small species aquarium—learn more in Daniel Knop’s Species Spotlight. With entire reef systems disappearing and predictions that reefs will begin to bleach annually by 2050, the coral reef crisis is rapidly reaching a point of no return. 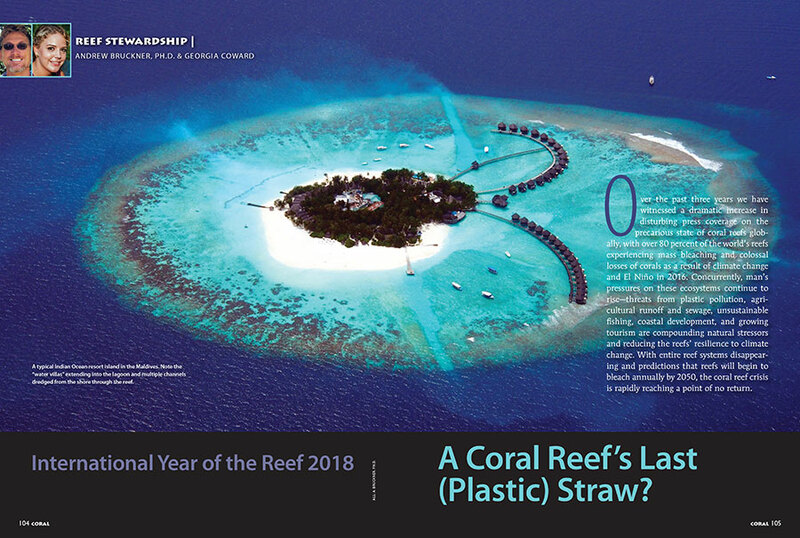 Is this A Coral Reef’s Last (Plastic) Straw? Read more in our Reef Stewardship column from Andrew Bruckner, Ph.D., and Georgia Coward. A Story of mir Tank is inside. How Van i buy this one? Hey Stefan, I’ll get in touch with you via email! Hey Stefan, I'll get in touch with you via email!